Husson University football coach Gabby Price congratulates his players in the first half of their college football game against Alfred State at Husson in Bangor, Maine, Saturday, Sept. 20,2014. Tailback John Smith and head coach Gabby Price of Husson University in Bangor are among those honored with season-ending awards by the the New England Football Writers Association. Smith, a senior from Fayetteville, Georgia, earned the season Gold Helmet Award as presented by the Jack Grinold/Eastern Massachusetts Chapter of the National Football Foundation. The honor recognizes the New England Player of the Year in Divisions II and III. Price was recognized as the New England College Division Coach of the Year. 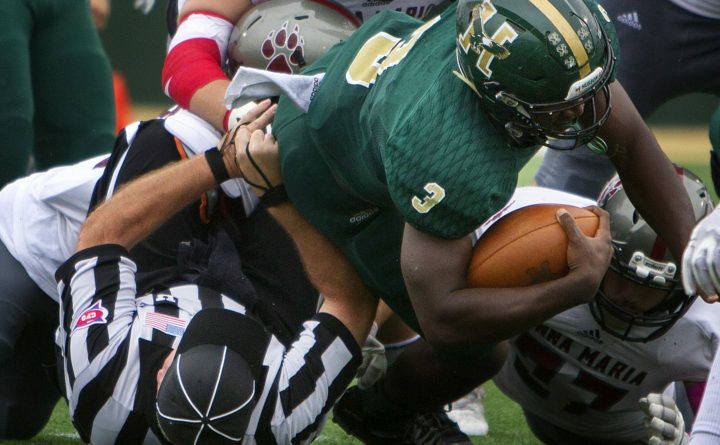 Smith led Division III nationally with 2,081 rushing yards in 11 games. His average of 189.2 yards per game also ranks first in the country. Smith’s 30 rushing touchdowns were second in the nation. In two NCAA playoff games, Smith rushed for 329 yards. Price directed Husson to a 10-2 record and the Eastern Collegiate Football Conference championship. The Eagles upset Springfield College in the first round of the NCAA Division III tournament before losing to No. 5 Delaware Valley on Saturday. 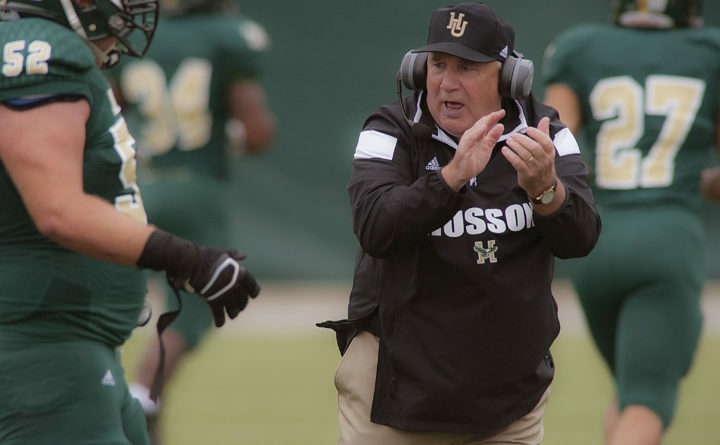 Price’s Husson teams have compiled a 39-13 (.750) record and four consecutive Eastern Collegiate Football Conference championships in the last four seasons. a 7-5 record by rushing for 1,432 yards and 13 touchdowns on 268 carries. Passes and 24 touchdowns while averaging 262.5 yards per game. The Jack Grinold Division I Coach of the Year is Yale University head man Tony Reno. Reno led the Eli to the 2017 Ivy League title with a 6-1 Ivy record and an 8-1 overall mark. Bentley University has two NEFW honorees. Noah Lamothe is the recipient of the Jerry Nason Award presented to a graduating senior football player from a college in the New England region who succeeds in football against all odds. Lamothe, of Weatogue, Connecticut, was diagnosed with a rare type of lymphoma prior to the 2016 season, yet continued to participate for the Falcons while undergoing treatment. He did not miss a day of practice. He dislocated a kneecap ending his participation in 2017 spring practice and prior to the season Lamothe’s cancer treatments were increased, yet again he did not miss a practice. He saw time on the Falcons’ special teams and served as an inspiration to both his coaches and teammates. The George Karens Award for contributions to football goes to Bentley’s Bob DeFelice. DeFelice has been at Bentley for 50 years as the varsity baseball coach, and for the past 27 years has served the dual role of director of athletics. Each of the awards will be presented at the New England Football Writers Captains and Awards Banquet on Dec. 5 at the Montvale Plaza in Stoneham, Mass.